Michael Di Venuto and Kyle Coetzer both hit centuries as Durham piled on the runs to take early charge of the season curtain-raiser against the MCC. Di Venuto (131) and Coetzer (123 not out) made light work of the pink Kookaburra ball in the heat of Abu Dhabi, sharing an opening stand of 181. Dale Benkenstein also made 41 as the county champions closed on 329-3. As well as using a pink ball, the match at the Sheikh Zayed Stadium is being played partly under floodlights. It is the first time the traditional curtain-raiser between the champions and MCC is being played away from Lord's. 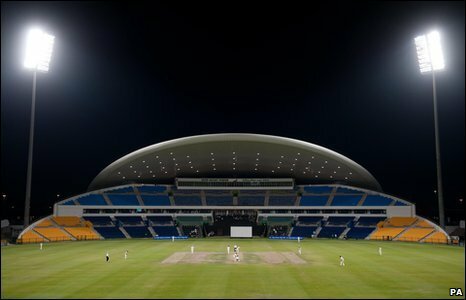 The match was switched so that the MCC and the International Cricket Council could trial the pink ball under floodlights with the long-term aim of introducing day-night Test matches. Di Venuto spent nearly three-and-a-half hours facing the pink ball and predicted it might need to be tweaked before being ready for Test cricket. "It was pretty easy to pick the ball up, especially at the start when it was really good," said the veteran Australian, who was out before the night skies descended at the Sheikh Zayed Stadium. "My only concern with the pink ball is the seam. The seam uses a green stitching which is pretty hard to see and if it was darker it would be pretty good. "No disrespect to the two spinners I faced here but with the really top-class international spinners, if you can't pick up the revolutions on the ball and which way the seam is going it's going to be pretty hard work." But asked whether he could envisage Test teams competing under similar playing conditions in the near future, Di Venuto added: "There's no reason why it can't work as long as the players go in with an open mind. "Whenever there's something different, like a pink ball, people are going to have complaints - it's the nature of the game - but we're using a pink ball so just get out and get on with it." Other than Jon Lewis beating Di Venuto with the fourth ball of the match there was little to trouble the Durham openers early on. Di Venuto did the bulk of the early scoring on an excellent batting track, the Australian bringing up his century less than an hour after lunch off 145 balls, including a six and 14 fours. He had taken his boundary tally to 20 when he was eventually dismissed, stumped by James Foster after coming down the track to James Middlebrook. Middlebrook struck a second time soon afterwards when Durham captain Will Smith chipped the off-spinner to Scott Newman, who took a juggling catch. Benkenstein then added 92 with Coetzer before being bowled by Dean Cosker. Coetzer went on to complete his own century off 194 balls in 307 minutes, and batted through to the close with Ian Blackwell. The MCC were dealt a blow before the start of the game when former England batsman Mark Ramprakash flew home for personal reasons.